Not all trademarks are words or logos, as this recent trademark application filed by the Academy of Country Music demonstrates. On July 23rd, the Academy filed an application to register the design seen below as a trademark with the U.S. Patent and Trademark Office. As I've blogged about before, it is possible to obtain trademark protection and a trademark registration for the way something looks, so long as the mark is (1) non-functional and (2) distinctive. TMEP 1202.02; TrafFix Devices, Inc. v. Mktg.Displays, Inc., 532 U.S. 23, 28-29 (2001). Generally, a design is functional if it is "essential to the use or purpose of the article or if it affects the cost of quality of the article." TMEP 1202.02(a)(iii)(A) (quoting TrafFix, 532 U.S. at 33). Additionally, because product designs are never inherently distinctive, an applicant must show that the design has acquired distinctiveness (i.e. consumers have come to recognize the product design as being associated with the applicant). TMEP 1202.02(b)(i). 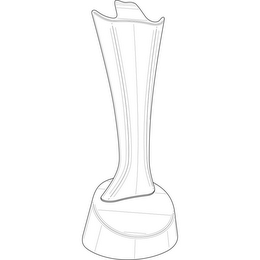 Interestingly, the Academy of Country Music already owns a registration for the design of its award trophy seen above. That design, which consists of "a 12" tall, 3-dimensional stylized rendering of a cowboy hat in satin silver on a black base" registered on August 31, 2004 and covers "Entertainment services, namely organizing and conducting annual entertainment award ceremonies and television shows" in Class 41. That registration also lists a first use date of May 21, 2003. Why file a new application for the same design? That's not clear, but if I had to guess, I'd guess (1) to submit a new, sleeker drawing of the trophy and/or (2) to expand the services covered by the registration (one cannot expand the scope of the goods or services listed in a trademark application after filing - see Trademark Rule 2.71(a) and TMEP 1402.06).